In 2013, a Greenpeace investigation revealed a shocking sight in the midst of two Indonesian palm oil plantations: the remains of multiple endangered orangutans scattered throughout and just outside land owned by two major suppliers. One of the companies, Bumitama, has expanded into what used to be a protected nature preserve, and intends to continue growing its development by a whopping 15,000 hectacres a year. The other company, BW Plantation Group, supplies palm oil to Procter & Gamble, a major multinational corporation that uses the oil in its shampoos and household products. Conservationists have known for years that irresponsible palm oil production is driving endangered species like the orangutan and Sumatran tiger to the brink of extinction, but this grisly find is shocking even to seasoned veterans. Some of the remains were found buried in shallow graves, hinting that the animals may not have died of natural causes — after all, orangutans don’t bury their dead, but humans certainly do. These remains were first found in early 2013 and continued to surface as late as November, showing that orangutan killings are an ongoing problem in the areas surrounding what’s left of the Tanjung Puting National Park. Greenpeace has asked the companies involved for clarification on the dead orangutans, but has to receive any satisfactory explanation. 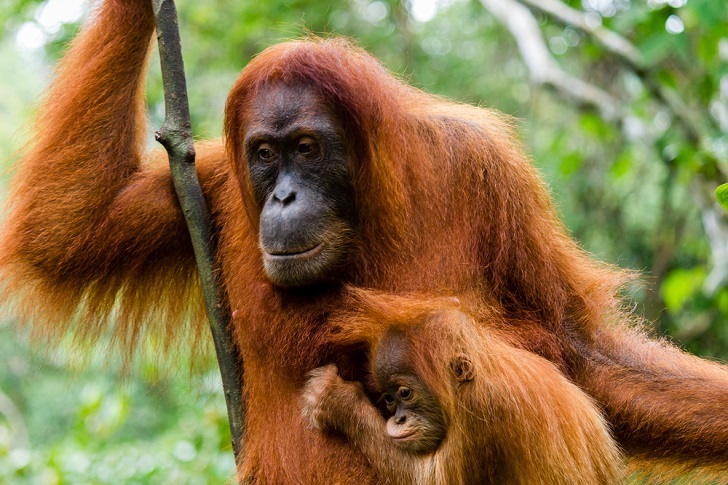 Now, along with a group of NGOs, Greenpeace is urging Procter & Gamble and other US companies which rely on palm oil to pledge only to purchase it from reputable suppliers who have taken demonstrated steps toward sustainable harvest. The organization believes that palm oil can be sustainably produced without any further habitat destruction, and that sustainable harvests are essential to helping Indonesia develop economically. If you’re interested in avoiding brands that are complicit in deforestation and the deaths of endangered species, consider purchasing from one of these companies which have already taken steps to sustainability: L’Oreal, Nestle, and Unilever have all pledged to clean up their supply chains. Hopefully, if enough of us take our dollars elsewhere, other big brands will be forced to take a long, hard look at how they’re operating. A remaining log from the recent clearance of orangutan habitat inside the PT Wana Catur Jaya Utama palm oil concession in Mantangai, Kapuas district, Central Kalimantan. PT WCJU is a subsidiary of BW Plantation. 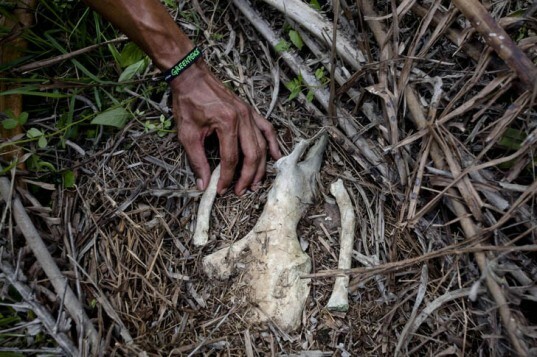 A Greenpeace investigation documents orangutan bones inside an oil palm plantation owned by PT Bumilanggeng Perdanatrada, a subsidiary of BW Plantation Group, near Tanjung Puting National Park in Kumai District, Central Kalimantan. A remaining log from the recent clearance of orangutan habitat in inside the PT Wana Catur Jaya Utama palm oil concession in Mantangai, Kapuas district, Central Kalimantan. PT WCJU is a subsidiary of BW Plantation. A solitary rainforest tree remains standing in a recently planted palm oil plantation on former orang-utan habitat inside the PT Karya Makmur Abadi Estate II palm oil concession. PT KMA II is a subsidiary of the Malaysian Kuala Lumpar Kepong Berhad (KLK) group. Greenpeace investigative team witnesses the newly cleared forest in an oil palm plantation owned by PT Wana Catur Jaya Utama concession, a subsidiary of BW Plantation, which is a palm oil supplier to Procter & Gamble in Central Kalimantan. Baby orangutans at the Orangutan Foundation International Care Center in Pangkalan Bun, Central Kalimantan. Expansion of oil palm plantations is destroying their forest habitat. Smoke from smouldering fires obscures an excavator digging a peatland drainage canal in the PT Rokan Adiraya Plantation oil palm plantation near Sontang village in Rokan Hulu.